The post war Raleigh Record Ace was announced in April 1946 (See pages 74 and 75 of the CTC Gazette HERE and HERE) as the pinnacle of the new post war range of Raleigh cycles but was delayed until its announcement in late 1947 in the “Cycling” magazine. This was most probably due to material shortages which was prevalent in the post war period. The post war Raleigh Record Ace “Model 26” as it was designated can trace its origins to the pre war Charles Holland “Continental” model which was introduced in 1938. This was the first bike specifically designed for mass start Road Racing. The cycle was named after Charles Holland, who, along with his team mates at Raleigh held 9 of the 15 Road Records Association records between 1936 and 1939. The continental was a model that was designed to sit alongside the existing pre war Raleigh Record Ace “Model 45” but was specifically designed for mass start racing. 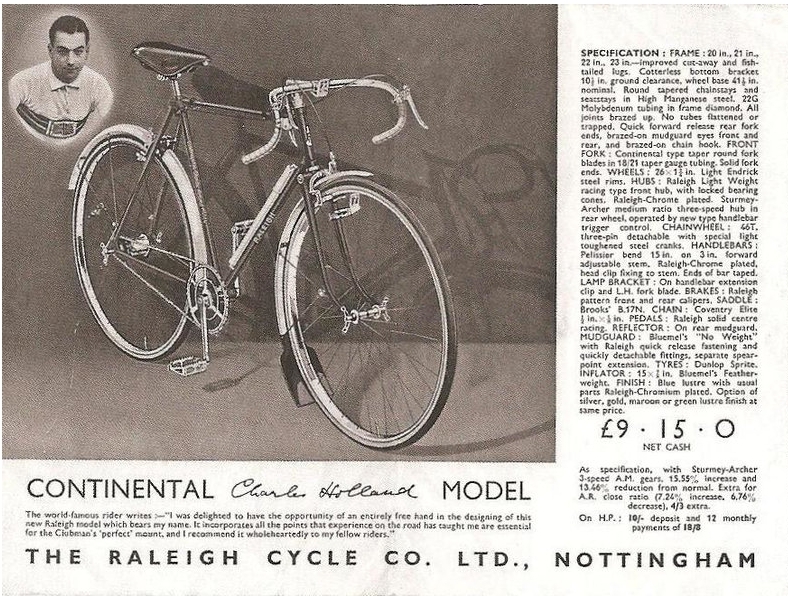 The frame used for the “Continental” was made from molybdenum steel, similar to the pre war Raleigh Record Ace. Raleigh at this time did not have a frame that was available manufactured entirely from 531 tubing. 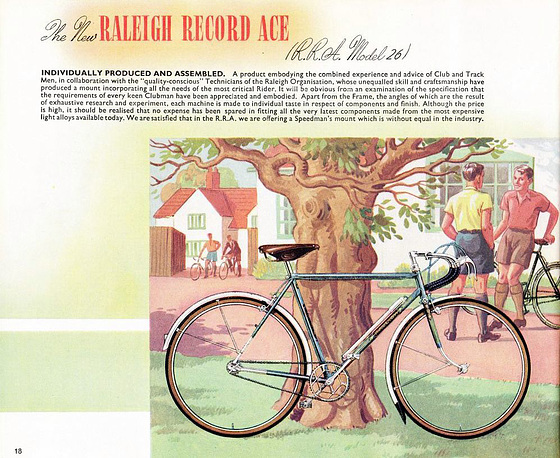 The pre war Raleigh Record Ace “model 45” also had its fair share of records. Tommy Godwin rode one to take the most number of miles rode in one year (75065 miles) during 1939-40. He actually rode 2 bikes, a ‘Ley TG Special’ (achieving nearly 27000 miles) and the RRA for the remainder. Raleigh stepped in with sponsorship after the first manufacturer found the sponsorship cost too much of a burden. The Ley cycle itself was not unreliable. The majority of the mileage was completed on the Raleigh Record Ace with a Sturmey Archer 4 speed hub, which had been fitted earlier on the ‘Ley TG Special’. A site detailing Tommy Godwin’s achievement can be found at www.tommygodwin.com. The post war RRA was designed by the young Raleigh Chief Designer Alan Oakley who was also responsible for the design of the Raleigh “Chopper” (1969) along with the Raleigh Works Manager at the time Sidney Buxton. This was the first cycle that Raleigh manufactured fully from 531 tubing and was designed as their flagship product. It was not available in any “badged” version such as Humber or Rudge. The very cost of the RRA (£39 9 s. 4 d in 1948- the average annual salary in the UK at this time was £495) made it rare and desirable but the quality of build, finish and components made it, quite rightly, one of the “Pinnacles of British Lightweights” of the era. One of the defining features of the RRA are its elaborate finish and gorgeous decal designs. Various colours were available, such as poly-chromatic or pastel finishes, along with black enamels. Optional paneling or lug lining could also be specified. The decals were made using a special form of gold leaf which must have proved very cheerful in a drab post war Britain! It is still considered one of the most stylish and handsome lightweight cycles of all times. 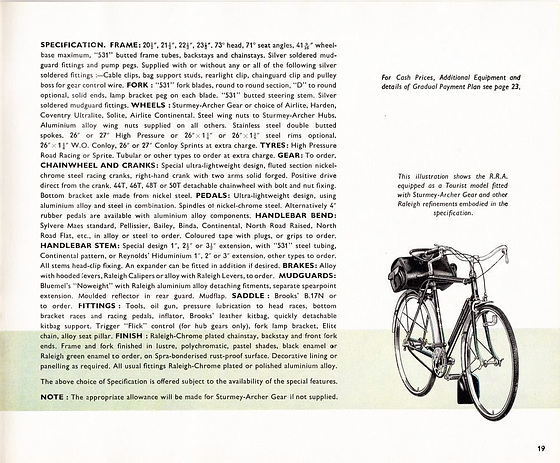 The RRA was the first Raleigh Cycle to be made available with a long list of lightweight component options which were not of Raleigh manufacture. As a result many of the components could be specified to customer request. Components such as Airlite, Harden, Coventry, Ultralite, Solite or Airlite, Conloy “ASP” rims, GB stems etc could all be specified. GB (which stands for Gerry Burgess) “Hiduminium” side pull brake sets were standard, along with Bluemel “No Weight” mudguards. Although not as as many as the pre war Record Ace, the post war Record Ace holds some notable achievements. Mary Dawson won the women’s Britain Best All Rounder (BAR) in 1954. Ray Booty on a special “Works” Record Ace managed to break the 100 mile 4 hour record in 1956. He achieved this distance in 3 hours 58 minutes 28 seconds on the 8th August. This record stood for 6 years. He also broke the straight 100 mile record one way which he achieved in 3 hours 28 minutes and 40 seconds. This record stood for 34 years! This was completed some time after the Record Ace was withdrawn from Raleigh’s catalogue. The RRA was the machine of choice of the famous Reg Harris during the late 1940s/early 1950s. In 1974 on a works RRA, which was over 25 years old (resurrected from the Raleigh archives), he won the British Sprint Championship in Leicester at the age of 54. This was the final swansong for the postwar RRA!